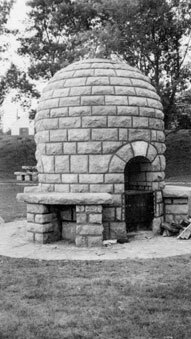 The three-family fireplace commonly called the Beehive was built in 1939 at the Highway 100 Roadside park that was originally called Lilac Park. See Highway 100’s Roadside Parks for complete information about the roadside parks. Plans for the construction of the beehive, 1937. 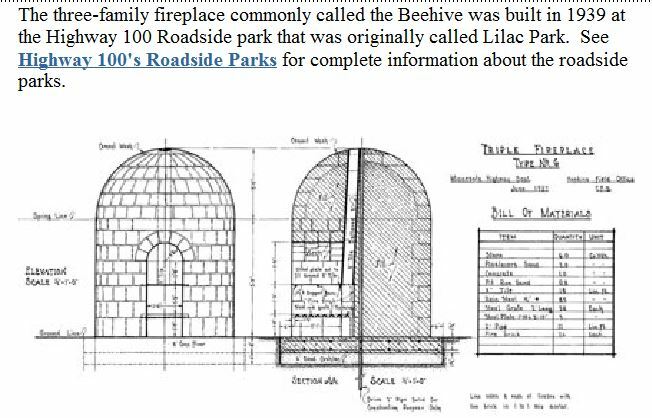 The beehive was the cornerstone of Lilac Park for decades with its distinctive shape and its ability to accommodate three picnicing families at once. In 1968 Lilac Park was bifurcated by an on-ramp to the highway, and Lilac Park declined. The park could no longer be accessed from the highway, and the grade from Toledo Ave. was steep. 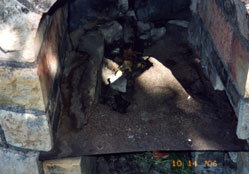 The Beehive fell into disrepair. 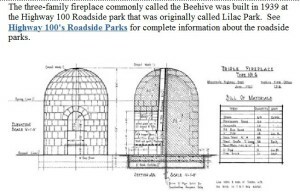 In 2008 the Beehive was moved to the Highway 100 Roadside Park at Highway 7, now known as the new Lilac Park. It was dedicated at the new Lilac Park on July 13, 2009. The pictures and resources below tell the story of the move and the history of Highway 100 and its roadside parks. 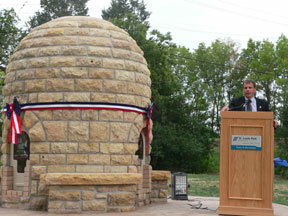 Click here for pictures of the July 13, 2009 dedication ceremony. Click here for a video of the move on October 22, 2008 and the dedication on July 13, 2009. 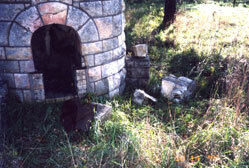 Click here for a story about the move of the beehive in the StarTribune dated October 8, 2008. Click here to see the City’s award in the Minnesota Pride Competition. Click here for photos of the beehive being prepared for the move and its arrival at the new Lilac Park (Highway 7). Click here for a Public Service Announcement about the move of the Beehive. (Donations are no longer being sought for this project). Click here for a 30 minute documentary about Lilac Way produced by TPT. Click here for a memoir of the building of Lilac Way/Highway 100 from the Minnesota Historical Society. Click here for a history of Highway 100.